As in Elmina, the OLA Sisters followed the SMA Fathers into mission in Cape Coast and opened a girls' school there in 1890. The school was held in the summer residence of Prince Ansah, which had been bought. Srs. Ignatius, Thais and Basile ran the school and kept a dispensary and a kindergarten on the side. In the same period, the SMA Fathers sought to respond to requests for missionary presence in Keta, Saltpond and Accra. Keta had been an outstation of the Catholic mission of Dahomey. But a war between the French and the people of Dahomey prevented the French missionaries from reaching Keta. In May 1890, Fr. Pellat, accordingly, sent two of his missionaries, Frs. Wade and Thuet, to reside in Keta and to do missionary work, applying the same method of “Church and School”. Saltpond in the 19 th Century was a busy trading centre. It had a port and road links with Kumasi and Salaga. In response to the persistent requests of Chief Graham of Low Town for missionaries and school, Fr. Pellat sent Frs. Ulrich and Groebli to start a mission in Saltpond. Chief Graham and his elders handed over to the SMA Fathers a church, which was originally built for the Weslyans. With the help of a voluntary catechist from Elmina, Master Desbordes, a school was started, although Fr. Groebli would die of sun stroke shortly. Fr. Ulrich received a replacement for Fr. Groebli and started a second school at Upper Town under the headship of Master Quaison, a Methodist convert. The collapse of the mission house in a storm and the departure of the missionaries on sick leave threatened the continuity of the school; but Master Quison kept both school and church going, until 1894, when Frs. Riche and Steber arrived from Emina. The missionaries began to rebuild their mission house, and it was ready by Easter. Everything seemed to be in place for a long stay, when a bad outbreak of Yellow Fever occurred. The two missionaries were infected. Fr. Riche died and Master had to bury him, because Fr. Stebr was in hospital. When he recovered, Fr. Steber went on sick leave, and again Saltpond was without priests. In 1897, Fr. Steber returned with Fr. Wade to finish work on the mission house and to build a church. Soon, again, Fr. Wade died of Blackwater fever. Fr. Maximilian Albert, the new Prefect Apostolic of the Gold Coast mission, sent two new priests; but in three weeks, Fr. Steber one of the newcomers and their doctor died. Fr. Albert, the Prefect himself, now went to Saltpond to finish the mission house. In August 1898, two new missionaries came to reside in Saltpond; and the Saltpond mission now developed outstations at Anomabu and far away Accra. In January 1893, in response to an appeal from the British Governor and some foreign Catholics in Accra, Fr. 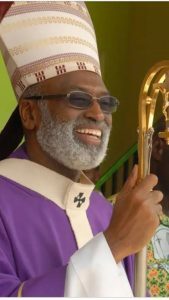 Pellat sent two priests to start a mission post in Accra. They stayed in a rented house and opened a school; but they could not do much, because of the lack of funds. The school stayed open only from 1893 to 1895; for when the outbreak of Yellow Fever badly reduced the number of missionaries available, the missionaries were recalled to Cape Coast. Until 1926, when Bishop Hauger would appoint two priests to reside at Derby Avenue, Accra would be taken care of by priests from Saltpond and Keta. Almost ten years of experience had taught the Fathers that they did missionary work best when they had their own house. So, when in the wake of the success at Elmina, the Fathers wanted to start a mission in Cape Coast, they first sought to build or own a mission house. That was what Fr. Pellat did when he bought a house at Idun. In June 1889, Fr. Granier and an ex-pupil of the Elmina School, Francis Haizel Cobbinah, left Elmina to begin a mission at Cape Coast. There, they converted the house at Idun into a hall to serve as chapel and a school. On September 1, the first mass was celebrated and on the following day, the first Catholic Boys' school in Cape Coast began.